We are not just looking for the right answer. We're looking for the answer that is right for you. The Weissman real estate litigation team has significant experience handling matters related to the construction, sale, use, and ownership of real estate. We understand that real estate issues not only touch on financial interests, but also extremely personal and sensitive issues for all involved. 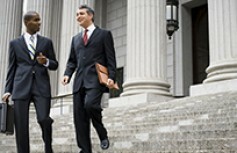 We work with our clients to determine the most appropriate approach to the dispute, from negotiations and alternative dispute resolution to jury trials. We represent builders, developers, real estate brokers, investors, residential and commercial appraisers, and homeowners.